Discover the Bucherer «Blue Editions» created in collaboration with nine Swiss watch manufacturers. Oliver is wearing a Fidelio roll neck sweater and BOSS blazer and trousers. 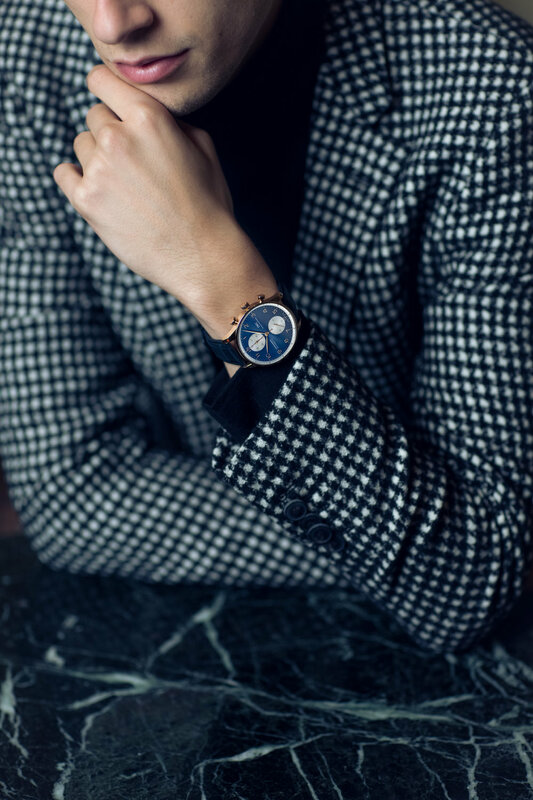 Last week the traditional Swiss watch and jewelry retailer Bucherer revealed their exclusive «Blue Editions» collection in collaboration with nine Swiss watch manufacturers. Blue isn’t just a symbol for House of Bucherer, but has also served as a century-old inspiration for artists. It reminds us of the sky, the sea and is undoubtedly the color of nobility. Blue watches are sought-after by watch aficionados around the globe, because they have a special aesthetic and distinguished look. 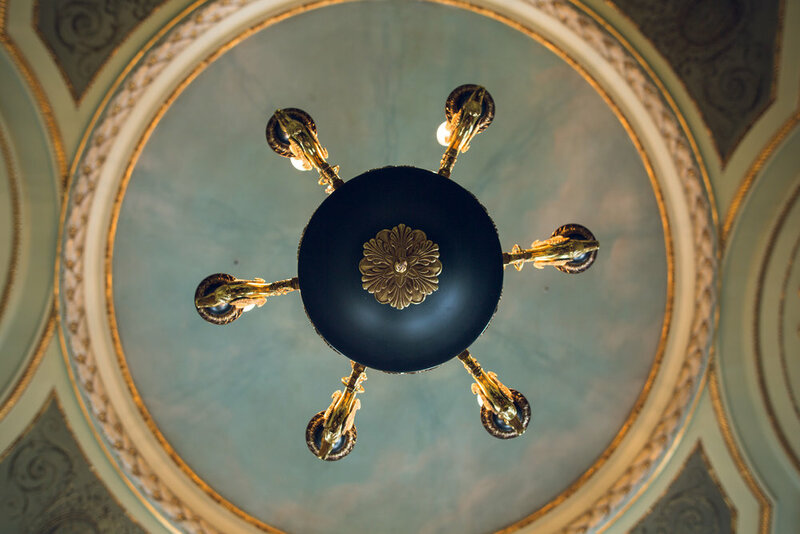 It was important to us to highlight the symbolism of royalty and nobility that hides behind blue, while giving it a modern touch. Set in the Napoleon Suite of the Grand Hotel Les Trois Rois we wanted to create a special setting and mood for each of those beautiful timepieces. Discover below the three models we chose and click here to see the full Bucherer «Blue Editions» collection. "The tradition behind the Portugieser family stretches all the way back to the precision nautical instruments used by seafarers to discover the world. A traditional line of nautically inspired precision instruments would be incomplete without a blue dial inspired by the sea. Thus, IWC manufactured the Portugieser Chronograph «Blue Editions» for Bucherer, a unique combination of a blue dial and a warm red-gold case. The shimmering sun-pattern dial offers a discreet contrast to the white counters, while the red-gold hands provide a wonderful highlight." Oliver is wearing a HUGO blazer, shirt and trousers. "Independence, tradition and innovation are part of the DNA of Carl F. Bucherer. The company remains faithful to the values of the Bucherer Group and its visionary founder, Carl Friedrich Bucherer. The Manero Peripheral created for the «Blue Editions» collection stays true to this philosophy and to the company’s exquisite craftsmanship, while also being an homage to the city of Lucerne. The petrol blue dial, that was created especially for this project, is an intriguing contrast to the stainless steel case and the dark blue leather strap." Moritz is wearing a HUGO suit and long sleeved woolen Polo shirt. "Blue forms an integral part of the history of the legendary Royal Oak watch, which, when it was launched in 1972, featured this color on its iconic tapisserie dial. Playing with forms, colors and materials it gives this watch a chic yet sporty appearance and make it a powerful chronograph built for watch aficionados who want to stand out from the crowd." This post was created in collaboration with Bucherer and contains sponsored content. All opinions are our own.